While exploring verdant rainforests, sweltering swamps, rugged coastlines, and high deserts, I collect my visual sources to result in artwork that is anchored in natural forms, either explicitly in landscape or subtly in abstraction and pattern. Subtle similarities of growth and decay in cycles of nature are often the focus. Forms shift from delicate and intricate to bold and invasive. Found objects or ephemera are starting points for my work in this exhibit: deteriorating or jumbled matter, meandering shadows, insect wings and plants. 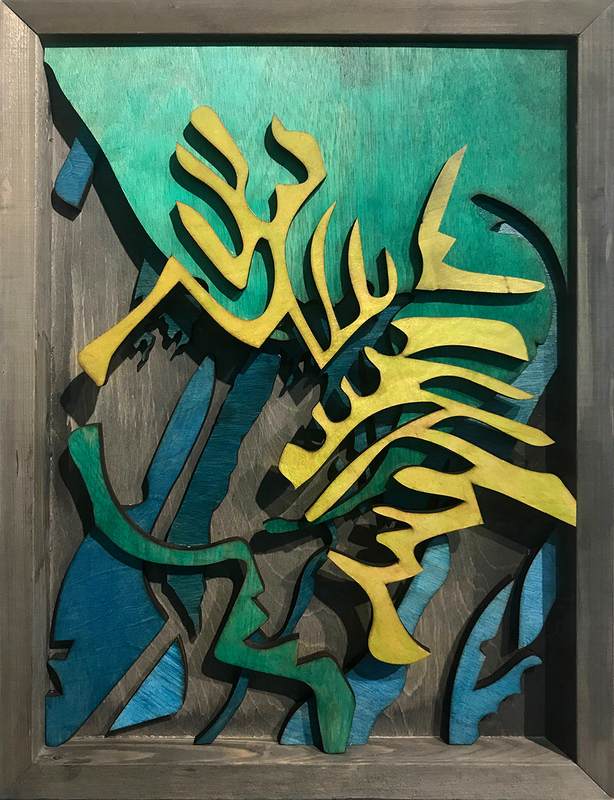 This exhibit includes encaustic paintings, mixed-media paintings and laser-cut wood. My work is a mix of realism, design, illustration and pattern and the medium changes from project to project to include encaustic painting, drawing, murals, photography, video and installation. Having been raised in the Sawiyano territory of Papua New Guinea, Sepik style patterning and carved line-work influences my work. Training in graphic design persuades me of the power of bold and simple shapes. And, not least of all, a background in academic painting convinces me to sometimes build up tone and color. I do not deem one way of working more important than another. The project itself deems which method, style, or media will be utilized best. For example, murals that are commissions are treated like a design project and content is usually dictated by the client so their imagery ranges dramatically from realism to flat graphic typography.